Choosing whether to undergo back surgery is a major decision. Patients need to trust the treatment their doctors recommend is warranted and appropriate. Unfortunately, there seems to be a disturbing pattern among some physicians in which spinal fusion surgeries are encouraged when they are not medically necessary. During spinal fusion surgery, hardware devices are used to hold a patient’s spine in position while bone graft material is inserted to generate bone growth. The goal of spinal fusion surgery is to fuse vertebrae together. The operation is performed to treat patients with fractures, curvatures, and other back problems. Critics of spinal fusion argue that the procedure is conducted too frequently. Due to the lucrativeness of spinal fusion surgery, some neurosurgeons and medical device makers may push for unnecessary operations. A large number of failed spine surgeries stem from medical negligence regarding spinal fusion surgery. The most common instance of a failed spinal fusion surgery is when three or more vertebrae are fused together. Other spine surgery mistakes, that can result in significant patient damages, include harmful pressure on a spinal nerve, operating on the wrong side of the back, or insertion of a broken or loose pedicle screw. 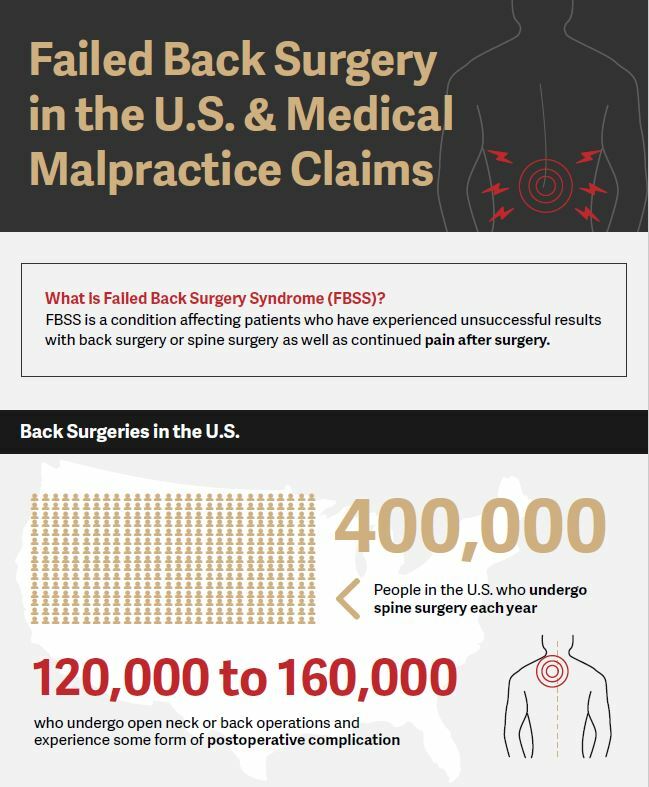 Physical injury resulting from spinal surgery medical negligence is often called failed back surgery syndrome, or FBSS. These injuries may involve recurrent disk herniation, spinal cord injury, persistent numbness, chronic pain, scar tissue, or paralysis. Paralysis is a devastating result of negligent spinal fusion surgery. While paralysis can be caused by an accident outside a hospital in some instances, a noteworthy number of patients are paralyzed under medical care. Paralysis caused by failed spinal fusion surgery may include spine damage from operation on adjoining tissues, failure to keep the spine immobile after a serious injury, or misdiagnosis of a fractured vertebra leading to unnecessary spinal fusion surgery. If you’re considering spinal fusion surgery, selecting the right surgeon is vital. Although most doctors have your best interests in mind, some may misdiagnose patients or push for unnecessary surgery. Incidences of doctors taking advantage of their patients are low. However, these cases do happen, leaving patients seriously injured or paralyzed. A notable unnecessary spinal fusion case involves a doctor who was accused of medical malpractice in Oregon. In 2011, the Wall Street Journal investigated Dr. Vishal James Makker, a neurosurgeon from Oregon, for performing unnecessary spinal surgeries. The Wall Street Journal found in 2008 and 2009 his rate of 39 additional spinal fusions per 100 initial spinal fusions was the highest in the country among surgeons who regularly performed the operation. In the case of Ronald Johnson v. James Makker, Mr. Johnson sued Dr. Makker after he performed six spinal surgeries on him in less than two years. Mr. Johnson claimed that he felt progressively worse after each operation and eventually notified Dr. Makker that he would not undergo any more spine surgeries. Dr. Makker said he never persuaded patients to have surgeries. He claimed he had more repeat surgeries because he took on more difficult Medicare patients. Mr. Makker was sued for medical malpractice eight times over the course of nine years. Most neurosurgeons in the United States are sued once every two years on average. He was also disciplined by the Oregon Medical Board for performing “medically unnecessary” spinal surgeries. Dr. Richard Deyo, a researcher from Oregon Health and Science University, gave expert medical testimony during the case. Citing four studies from Europe, he explained that European patients who suffer from lower back pain caused by worn-out spinal disks often do not see more benefit from spinal fusion surgery than from nonsurgical treatment. Dr. Deyo stated that “the U.S. does five times more spine surgery than the United Kingdom [and] twice as much spine surgery as other developing countries. There’s no evidence that we’re having better outcomes”. If you incurred damages from what you believe was an unnecessary spinal fusion surgery or other medical negligence, contact an experienced malpractice litigation attorney. A medical malpractice lawyer from Miller & Wagner can advise you of your rights and advocate on your behalf. At Miller & Wagner, we serve spinal surgery medical malpractice patients in Portland, Vancouver, Salem, Eugene, and Bend. If you or a loved one was injured as a result of unnecessary spinal fusion surgery, schedule a free consultation with one of our experienced medical negligence attorneys today.